Believe it or not but India is all about food. If you really want to feel the real India then you need to try food here. I am food blogger and I feel myself fortunate to find it the most interesting topic to write. If you want to explore India then here in this blog, I am hopeful you will find 70% of it because I am going to tell you about Indian food and particularly India street food. The heart of India lies in street food. No matter whatever is the standard you carry in society, you can’t stop yourself tasting the delicious street food and this is the beauty of the country and people here. Whether it is puchkas of Kolkata or Vada Pav of Mumbai, every street food in India has its significance and value. This is a reason why I am here with the entire list of 9 best street foods of India. 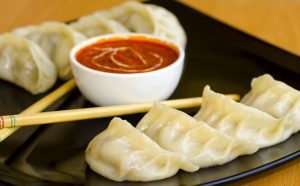 Well, it is not about only these 9 street foods. There are more than 9 thousand varieties but in this blog today, I am putting the 9 best in your plate. So, let us start the perfect journey to the most popular street foods of India. Every Place in India has its own version of Golgappas and puchka hits the top position every time. 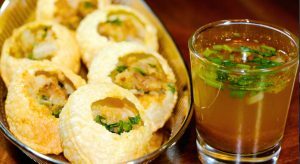 Puchka are the Bengali versions of Golgappe or Paani Puri. Whatever the name be, but there is certainly no better alternative to beat the heat than these little tangy-minty delights. We lost ourselves drooling while watching Kangana make these mouthwatering feasts in Queen as well. The best Puchkas are the ones served on the roadsides. No matter how choosy one gets about food but when it comes to these spicy delights almost every day finds it difficult to resist themselves. Delhi and chaat goes side by side. Can you believe that this excessively common street food originated right from Shah Jahan’s kitchen? Yes, the Mughals too had a slight inclination to the sweet & sour world. 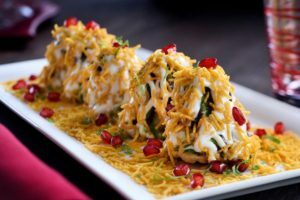 A North Indian Cuisine, chaat has evolved to various new forms – Dahi Puri, Bhel puri, Paani puri can be thus considered as cousins of this tangy treat. Well whether it’s the crispy combo or the mouthwatering blend of sweet & sour, we certainly are in love with this colorful fusion of tastes. 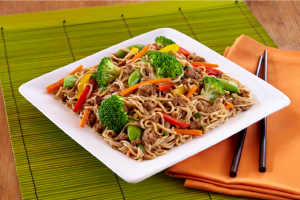 India is incomplete without chow mein and you would get to know when you will stroll over the streets of India. Chow mein, is one dish that actually made street food all the more popular in India. There was a time in 90’s when every next food stall had lines of people waiting for scoops of these noodles on their plate. Hot red noodles getting tossed and turned on open flame is enough to salivate your mouth. 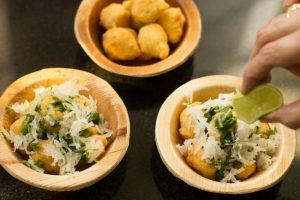 A dish that is constantly evolving with more and more flavors being added to it, is undoubtedly the best snack to have with friends and family. Apart from dusty roads and numerous trucks waiting for their clearances there is something else that makes Lakhanpur – the entry point to the state of Jammu & Kashmir known among the masses – ‘Bhalle’. A fried snack made from pulses which are best served with shredded radish and green chutney. I am sure that if you will happen to pass this place, you cannot stop yourself having this favourite snack. If its bread and butter in English then we have our own desi version of ‘Chhole bhature’. This lip smacking Punjabi cuisine is a staple breakfast in majority of Punjabi Households. Mouth-watering green peas cooked in traditional Punjabi spices and curry along with fried bread is enough to salivate your taste buds.Initially a street food rampant in the streets of Amritsar this luscious street food is now readily available almost everywhere in India. 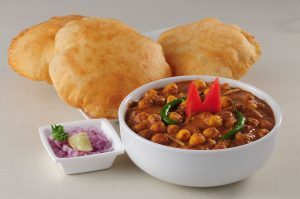 But if you wish to get the taste of real Punjab then take a trip through narrow colorful streets of Amritsar and order a plate of this bombastic combo of Chhole Bhature. Now here comes something that will fantasise you at the street of Uttar Pradesh’s capital. 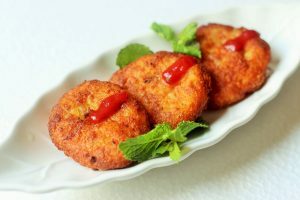 Aaloo tikki is a delicacy of city of nawabs ’Lucknow’. Owing to its popularity every city has now made its own versions of this exotic cuisine. In Mumbai this is Ragda Pattice while in Delhi it is often confused with aaloo chat. 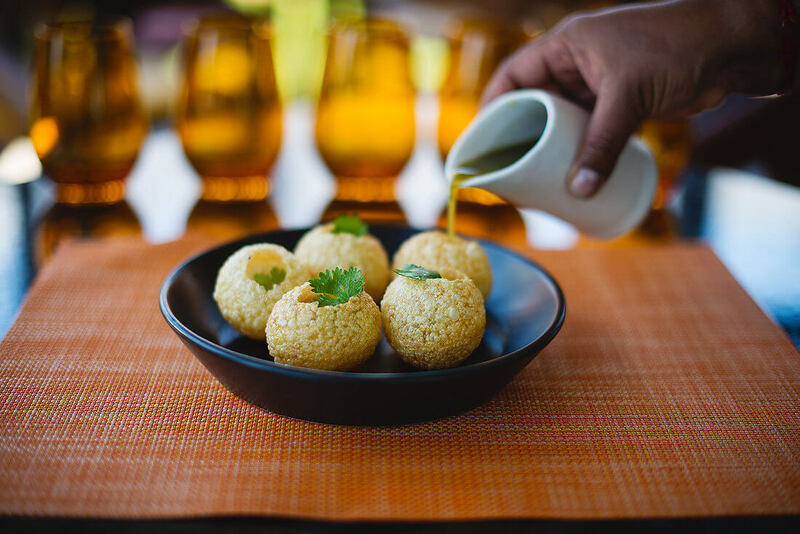 Well famed for its wide range of non-vegetarian cuisines, Lucknow, offers a delight to the veggie lovers in the form of these small puffed mashed potatoes ‘Aaloo Tikki’ well served with spicy green peas curry and sweet – sour chutneys. Describing Lucknow without the name of Tundey Kabab would never be a favour to the street food in India. 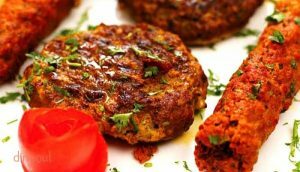 It is the best version of Kebab that you will ever have anywhere in India. Exceptionally soft and succulent till the core is what makes these kebabs an all-time beloveds. Haji Murad Ali, the creator of this authentic cuisine had only one hand and hence the name Tunday as in Hindi a person with one hand is called Tunde. Now, here comes something from the state that has given many numbers of bureaucrat and politicians to India. Bihar has told that how you can be the best staying simple and this is what the street food of Bihar tells us. Litti Chokha is the Bihari version of Dal Batti of Rajasthan. 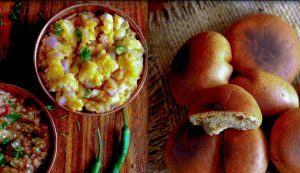 What makes this dish unique from the rest is that, this love of Bihar is one of the traditional cuisines that can be eaten as breakfast, lunch as well as dinner. A spicy curry or chokha made from brinjal or mashed potato is served with Litti or bread made from grams. An amazingly mouthwatering cuisine is well enjoyed with a spoonful of ghee. This exotic cuisine has gradually made its way from the streets of Patna to all over India. To Aa Gaya Na Muh Mei Pani…Apart from calming the taste buds street foods of India gives the best business opportunity too. I hope you remember our prime minister promoting pakoda business in one of his speeches. If you also want to do something fruitful in life then start your street food business. Keep it classy and take street food franchise from a brand like Chhat ka Chaska and it will make you a great businessman in no-time. I hope you have enjoyed my blog. Write to me for more suggestions and queries.